The Sherman Tank was one of the most numerous AFV’s ever produced and was the backbone of the Western Allied armour formations. The General Sherman (To give it its correct title in British Service) was apparently named by Winston Churchill after the US Civil War General as was the practice of the UK purchasing commission at the time. The were originally known as known as Swallows due to the codename assigned them for official correspondence of the period and somewhere along the line the name Sherman Stuck. After the disastrous Fall of the Tobruk Garrison in the Middle East all looked very bleak for the 8th Army which was all that stood in the path of Rommel’s Afrika Korps whose confidence was high and equipment was first rate. Winston Churchill happened to be in Washington at the time and could hardly conceal his deep shock at the losses it seemed the Suez canal may fall to the Germans. Roosevelt immediately offered whatever assistance as might be needed. Whilst it was originally planned to send the US 2nd Armoured division the timeframe to ship an Armoured Division was thought to be too great so they sent the next best thing – 300 brand new M4 Medium tanks and 100 M7 Self propelled guns drawn from the US Armies own stocks (which were pretty low as they had just gone into production). In less than four weeks the first shipment was on its way in July 42. The Swallows were a mixed batch of M4A1 and M4A2 (designated Sherman II and III respectively by the Brits) exhibiting the early features of the Sherman Family in Direct Vision Slots for the Driver and Co Driver and M3 Suspension. The British further modified these based on their experience and added Sandshields, Turret Stowage Boxes, Water Can Racks and “sunshield” rails (These were rails to hold a deceptive camouflage shell designed to make the vehicle look like a truck). During the 2nd Battle of El Alamein in October 1942 over 318 Shermans of M4A2 and M4A1 models were fielded, all of them early models with Direct Vision slots for the driver and co drivers vision. Most of these variants used the earlier M3 Medium tank suspension however a number of these had the new M4 VVSS suspension and this kit represents such a vehicle. They continued to serve right through the North African campaign with M4A1 in the 8th Army and the recently arrived 1st Army in Tunisia replacing its Crusaders for M4A2 Shermans. Only the M4A2 and M4A1 served with the British in North Africa with almost all of those in the 8th Army being the Direct visioned hulls. The Direct Vision variant as supplied in this kit surprisingly continued in production well into 1944 so a range of user options is opened up to the modeller with DV A2’s seen in service with the Brits, Canadians, Polish, New Zealanders, French, Russians and US stateside training units. 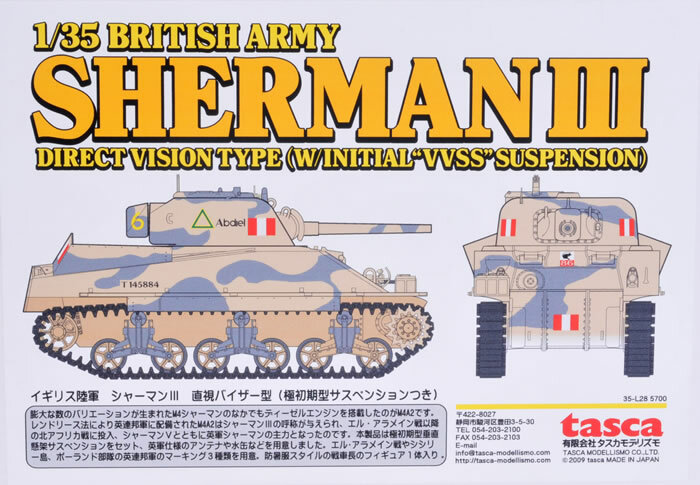 This kit is Tasca’s first M4A2 variant of the Sherman line previously having done superb kits of the Sherman M4A1 and M4A4 variants including an excellent direct vision M4A1 Direct Vision Sherman. Tasca surprised most with this historically significant variant and I have to say as an unashamed Shermaholic it was a very pleasant surprise. Tasca are known for quality kits and this is no exception. Everything about this kit is quality from the Box through to the excellent instructions. 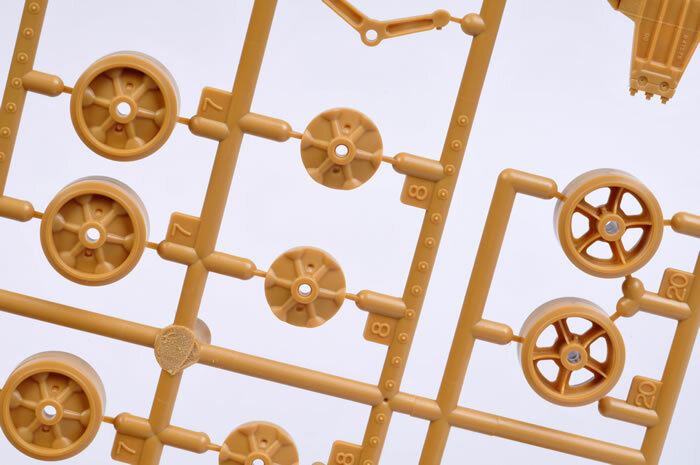 While No PE is provided it is obvious from quality of the parts it is not needed although the headlight jig from the VC is in the kit if you decide to add aftermarket PE. 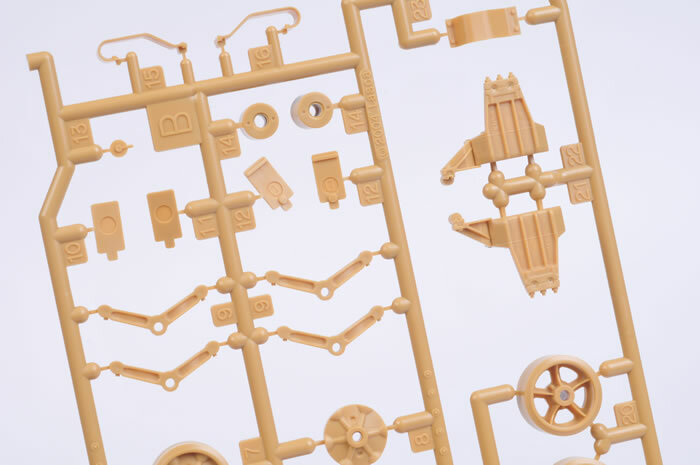 The kit has 14 sand coloured sprues that make up the vehicle; 1 clear sprue of periscopes (including spares) and light lenses; two Green sprues of their magnificent correct early mount 50 Cal MG and four superb US style Fuel Cans; four well detailed track runs in Vinyl (T 51 type track) and a sheet of three decal options. Construction is the same as for previous Tasca Sherman’s with a multipart lower hull which assembles superbly, a 1 piece upper hull which has welded splash rails and fabricated Antenna Bracket and Hull MG socket. The weld seams are restrained and represent the US flow style welds perfectly. The glacis Weld configuration corresponds to one of the known types. 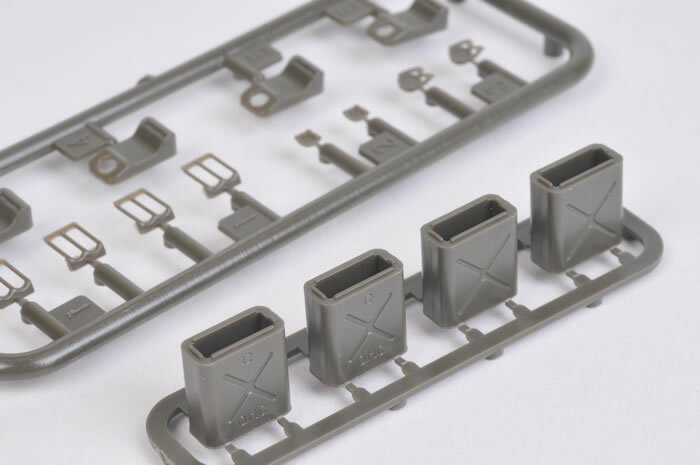 Optional parts are included for the rear turret splash rail with both the Cast and fabricated type given in the kit. A separate rear hull plate is provided with the correct six horizontal bolt layouts and off centre vertical bolts. 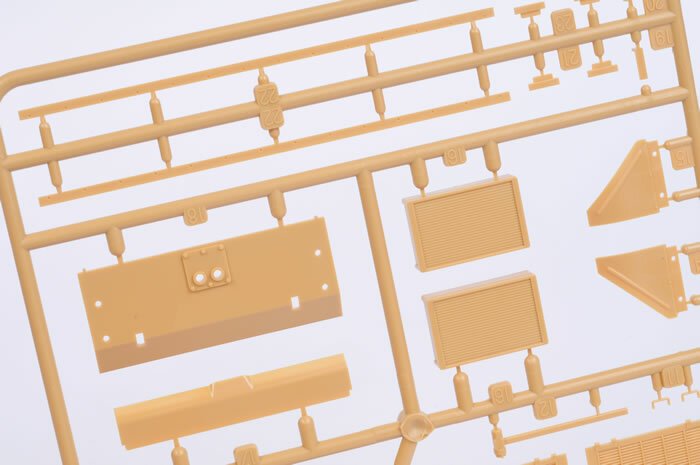 This is correct for later M4A2 variants as depicted in the kit. Where it gets tricky is which Turret rear splash rail goes with it. Fortunately there are pictures of both types fitted to these but the general rule of thumb is that the cast is a later feature and goes with the later six bolt rear. The fabricated is usually seen with the earlier fabricated 11 bolt rear. 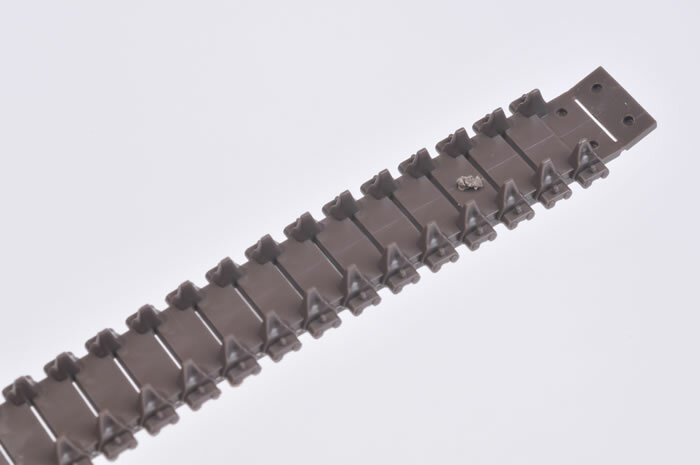 The running gear is the heavy duty VVSS type exhibiting mid production features such as the horizontal return roller arm with a spacer to raise the height of the roller (This was later dropped and the arm upswept to ensure they sat at the correct height). These were not generally fitted to earlier model Sherman’s and will not be easy to remove. Short of buying aftermarket ones you are stuck with these although only a Shermaholic will notice it. 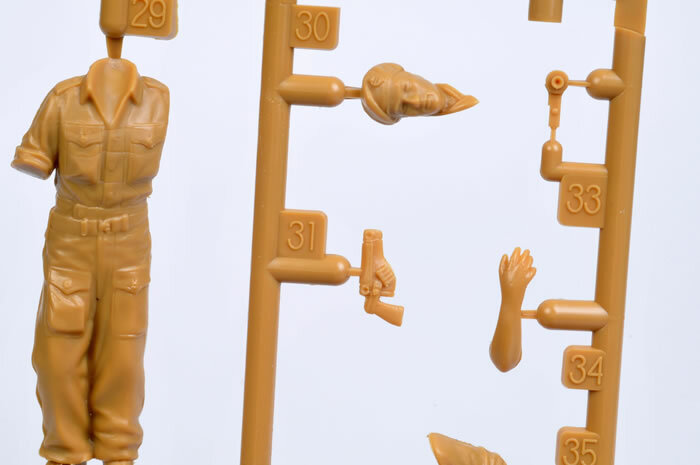 Their excellent correctly articulated suspension is included and if assembled correctly will operate like the real thing. Small pieces of foam have to be cut from the supplied sheet and inserted to the bogie as compression. I’m not a fan of this unless you need compressed suspension. I recommend using plastic card cut to size or cut up an eraser which is a bit stiffer. If you don’t the foam compresses over time and the tracks get sag which is not correct for Shermans. Two types of roadwheel are supplied, the spoked and pressed steel types commonly seen on desert Shermans. The pressed steel type tends to be seen on later issued vehicles. Three types of drive sprocket are included covering the major types seen on Shermans. It is best to check photographic evidence for the type you fit. The instructions direct you to use part A3 and A4. All three of the depicted subjects appear to have this type and the spoked Roadwheel and Idlers. The hull is presented as a one piece mould with a separate rear plate thus allowing the bolts to be molded on avoided the fuss of shaving bolts off sprue and trying to position them correctly (assuming the carpet monster doesn’t get them first when they fly off the sprue or tweezers) The Engine hatches are well done and the detail on the rear deck is as per the real thing. The lower hull rear is superbly done with excellent representation of the large and complex casting of the exhaust manifold and separate mufflers. Above these under the over hang is an accurate representation of the two large radiators and heat deflector. 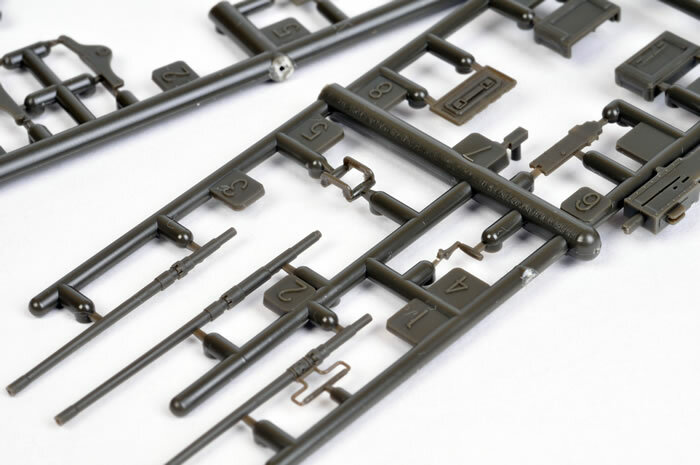 The typically British fittings such as the sunshield rails and sandshields are done in plastic and well detailed although the outer brackets are best removed and replaced by square brass tube as these are depicted as moulded blocks. The side skits are done in plastic and the fenders are a superb fit unlike a certain opposition companies PE set. They are moulded in extremely thin plastic and really look the part. The headlights come with clear lenses and early style hatches without springs are supplied , again correct for the variants depicted. The headlight brackets are surprisingly not offered in PE but fine plastic which in this case is more akin to the real thing IMHO as I find the PE a bit one dimensional where the supports attach. A separate dust cover attachment rail for the hull MG rounds out the hull front although this is for option 3 only. The turret is the correct early low bustle type with periscope gunner’s sight but the small pipe like bracket in the centre front needs to be removed for an early vehicle. This is the spotlight bracket and these were not fitted to early Shermans. The cupola is excellent offering internal padding and great detail. 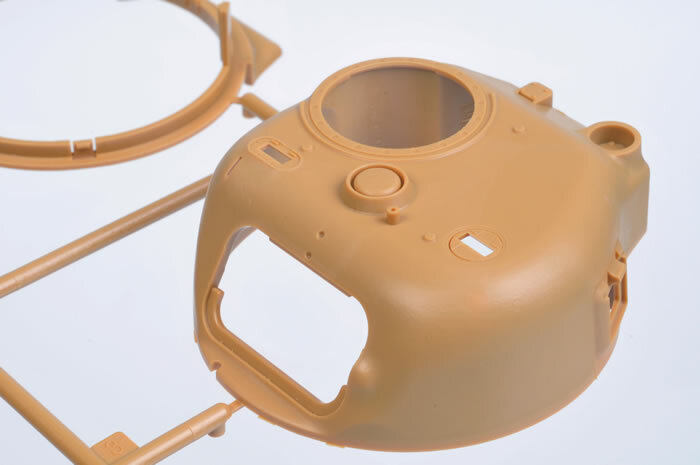 The cupola flaps have separate detail pieces for the padding and securing latches. Check your references as to the vehicle depicted because the Brits tended to remove one flap in action. 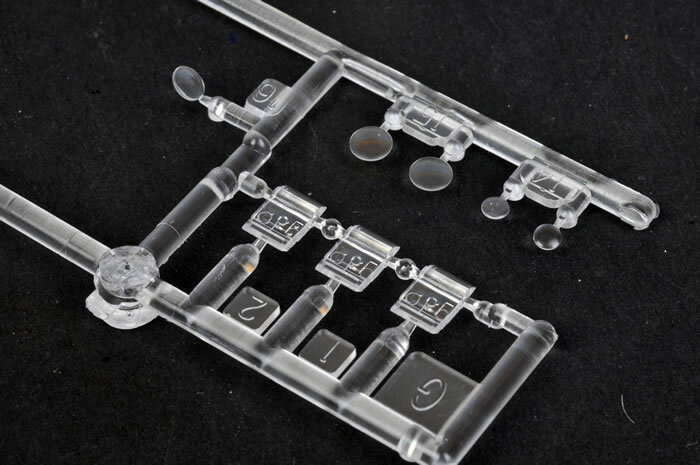 Periscopes are supplied in both Clear and coloured plastic with separate covers. 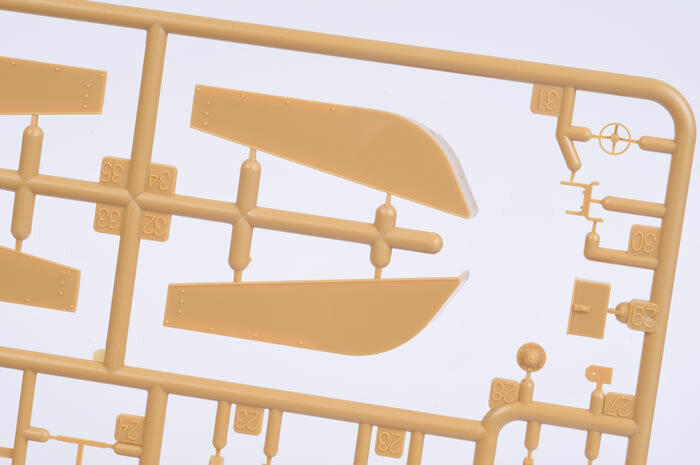 The kit offers the early and later (winged) narrow gun shields. A very nice Coax 30 cal in cradle is supplied but no gun breech for the M3 75mm which is supplied with a two piece barrel in flared and non flared types although you are directed to use the flared. 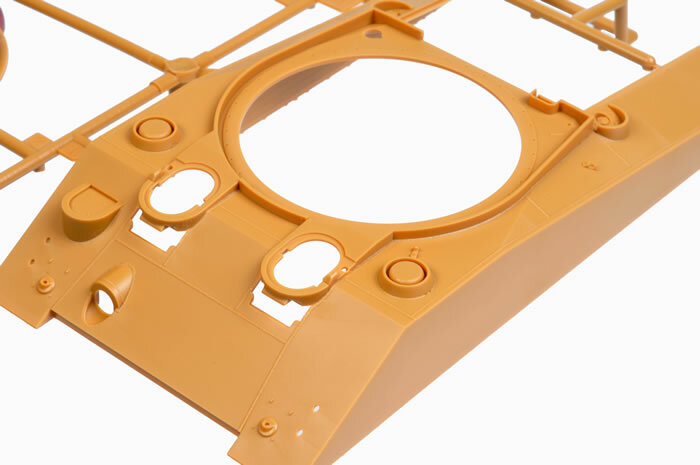 Correct British antenna bases are supplied as is a Crusader style Stowage box supplied in two pieces so that it may be depicted open. Smoke dischargers are supplied for the Polish example but I found these a bit under scale and of a later type than seen on the polish vehicles. Tasca show both the early and later position for the turret lifting rings (D6) by marking option which is appreciated. The turret mounted 50 cal seen on almost all North African Shermans is superbly down and quite simply the best plastic 50 cal available. Both early 40 rd and later 100 rd ammo cans are provided and unlike other brand’s kits the pedestal and mount are the correct type for an early Sherman. 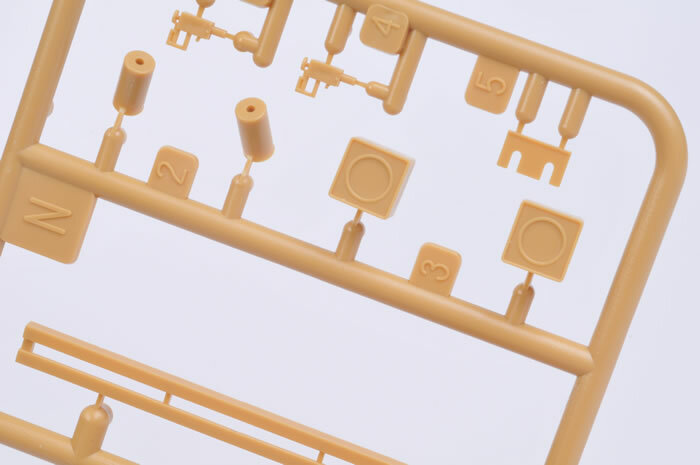 The tracks provided are Tasca four part vinyl T51 and are well detailed. Earlier variants used T41 but T51 was also used particularly later in the NA campaign. The British WE 210 Double “I” were also used. For those who wonder about the difference between T41 and T 51 it is that the earlier T41 was double thickness reversible blocks whilst the T51 was not reversible with only one side with the thicker pad. Polish 1Sqn Krechowiecki Lancers Autumn 1943 in Palestine named Bohun. All options are correct for the type in the kit and accurate to known photos. Importantly these photos are all available readily in cheap references. 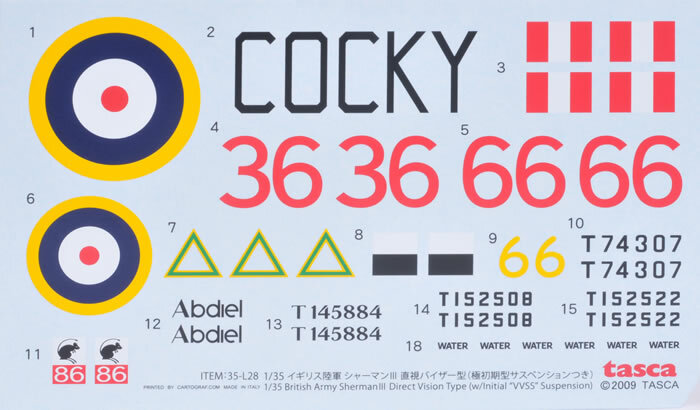 The instructions, funnily for a Sherman kit of late are clear, well illustrated easy to follow and call out optional parts for the marking options. Importantly they have correct part numbers and don’t have you using the wrong parts. 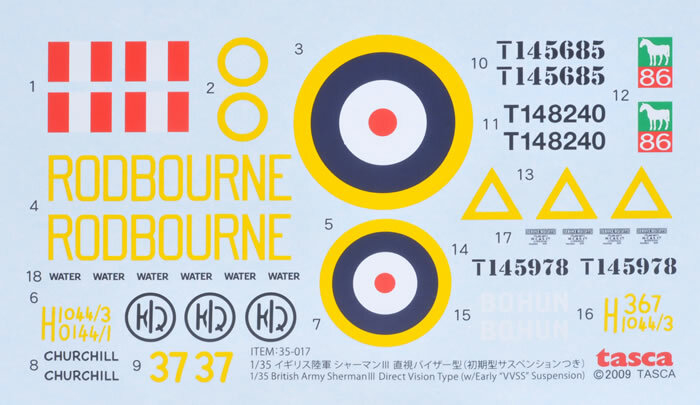 Markings are in register and offer small stencil markings for stowage along with both turret and hull recognition RAF roundels although I have my reservations as to ring sizes and proportions. Fonts match the photos perfectly and show that the attention to detail was pretty high. Kit number 35-L28 is a limited edition release packed in a plain white box. 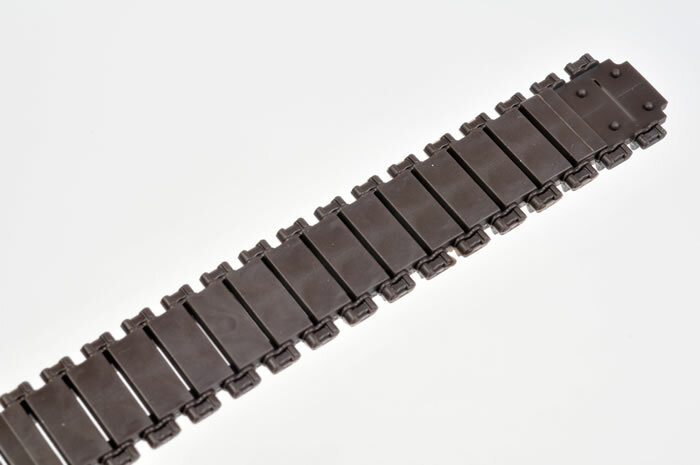 The main difference is the inclusion of the initial M3-style suspension with the return rollers mounted directly above the centreline of the bogies. 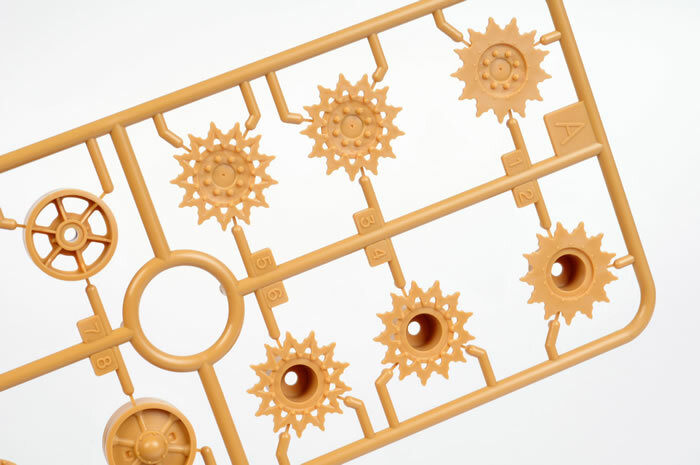 Three markings options are also provided with this kit. All the vehicles are camouflaged in Light Stone with a disruptive pattern in Blue Black, with White countershading underneath the hull. This kit is the best Sherman Kit I have yet seen and I only noted a few minor points. The suspension is the later type with raised spacer for the return rollers. The rails as detailed above and the bolt strip for the transmission which should have semi recessed bolts. 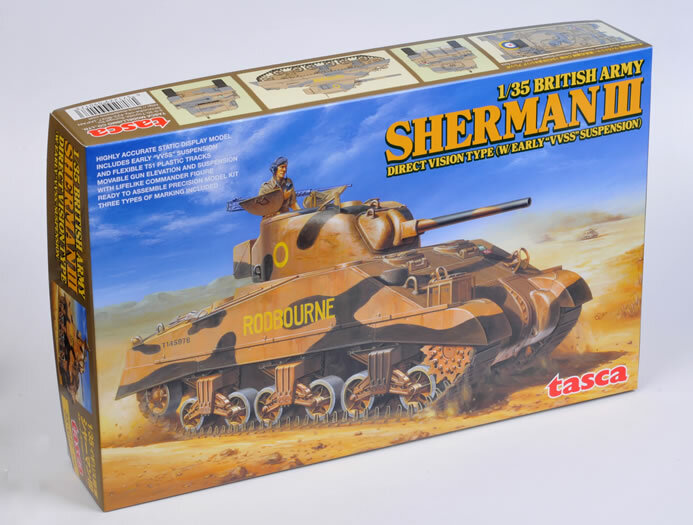 Tasca have really done their homework - it is the most accurate Sherman I have yet seen in a kit. A stunning DV Sherman can be made easily from this kit and a lot of very useful spares such as there excellent (and correct) cupola and hatches. 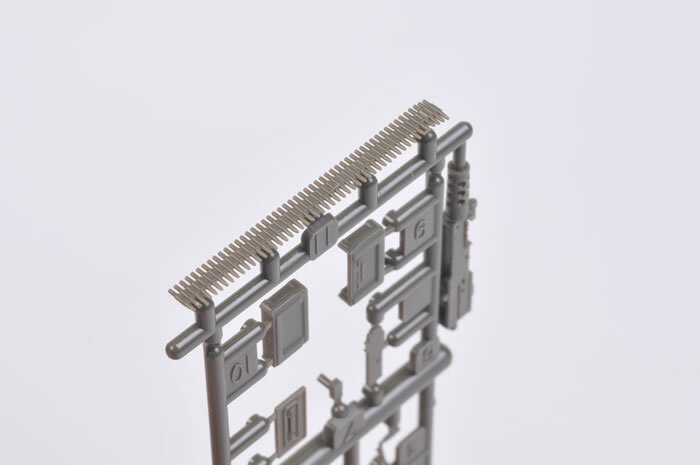 Many parts useful to the Sherman modeller are left over as a result of the practice of using multiple options sprues as do most manufacturers who make 1/35 scale Shermans. Some of these spare parts in my kit include applique armour, spare 30 cals, spare three piece transmission cover and more useful the spare cupola and early hull hatches plus a set of pioneer tools. Most welcome additions to the spares box. The M4A2 DV served with the Polish, Brits, New Zealanders, French, Canadians and Russians so the kit offers up a whole range of marking options from the North African, Med, Italian, Nth West Europe and Russian Campaigns a fact hopefully not lost on aftermarket decal manufacturers. 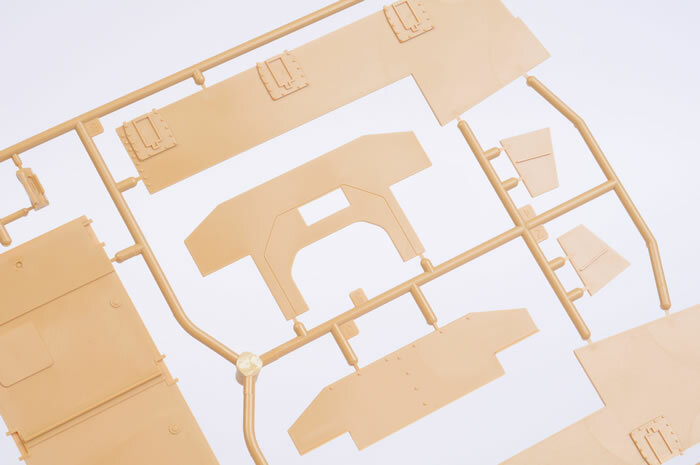 Most of the parts needed for later war variants such as appliqué armour are already in the kit. Like the Tasca Shermans before, this kit really sets the bar and whilst it is not the only kit of this subject available it is truly is in a class of its own. Is this the long sought after perfect Sherman Kit? The answer is no, but until that comes along it is the nearest thing to it. The price of Tasca Shermans has been a sticking point with some but when you look at what you DO NOT have to add to this kit and how close they are to the mainstream opposition they are much better value for money, more accurate and IMHO much easier and less frustrating to build. For those wanting an earlier Alamein vintage M4A2 I wholeheartedly recommend the Tasca kit 35-L28 which is has the Initial VVSS suspension from the M3 (Medium) series of tanks. Thanks to Tasca for the review sample.